…. Enthusiastic Brotherhood — Our Supreme Knight inspires listeners on membership; a district leader shares the value of Knights in his life; we hear more impressions from a first time attendee at Supreme Convention and the Wow factor — is this a great way to live – and to live it with enthusiasm – why not? Russ Yount is our district deputy in the Cedar Rapids area beginning his second year in this role. He and his wife Bonnie attended the supreme convention in Toronto for the first time. I asked him for his greatest impressions of their time in Toronto. I hope you noticed that Russ also found Salvatore’s fraternal address to be appealing as he used “brother” in our address. Both of us and many others were reminded that our order like our church is truly “catholic” or universal with representatives from many backgrounds and rites. However it’s the interaction with local brother Knights that is the stuff of most councils. Another Russ … Russ Wendell is our District Deputy #17 an area in north central Iowa which includes his home town of Eagle Grove, Webster City, Humbolt and Fort Dodge. Like brother Yount, Russ Wendell is an adult convert to Catholicism. Russ and I sat down and talked about the impact of the Knights of Columbus in his life. I think you will hear why he continues to be involved and why it drives him as a leader. Russ shared with me his view of the Knights revolve around being passionate about our church and our faith. He certainly has that passion in action with the Knights. This is Mike Gaspers for the Knight Life. We have been talking with Russ Yount and Russ Wendell both adult converts, District Deputies, and on fire for the life of a Knight of Columbus leader. 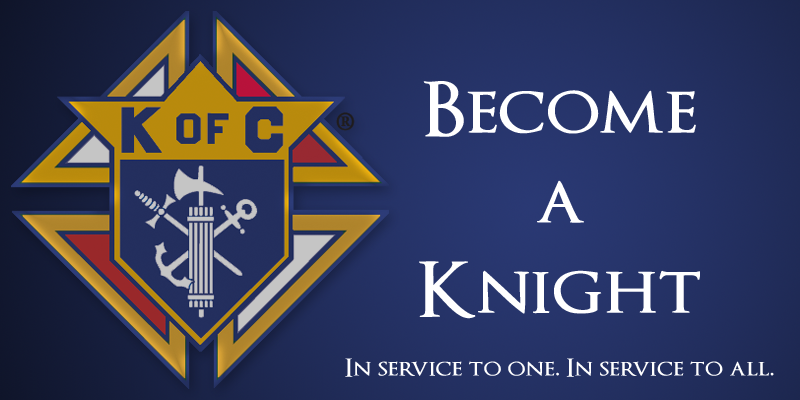 I invite you to learn more about Iowa Knights by visiting www.kofc.org where you will find information on how to be involved. I also encourage you to listen again to this week’s interview and those previously aired as easy to play podcasts at http://iowaknightlife.org/. You can share the podcast link on Facebook or email it to your friends. All of you can be inspired by the story of Iowa Knights as you listen online. Paul Martin was the Iowa Grand Knight of the Year for 2014-2015. I was visiting with Paul about the Knights and he gave me some words of encouragement and shared how enthusiasm is the key to salesman ship in life and with the Knights. Paul is a great salesman and we can all take a lesson from him on enthusiasm. As Knights we have so very much about which to be enthusiastic. Being a member of the Knights – this band of brothers has benefited me as a husband and father. My lifelong friends are often Knights as well. As I’ve mentioned before, the Onawa-Blencoe Knights are close to my heart as I was their district deputy many years ago. I still drop in occasionally for meetings and last July was invited to their officer installation. While there I addressed the men on the need to continue to reach out and grow their council by adding new members. A commonly heard commercial asserts “at the corner of Happy and Healthy” is the place to be. While I believe most of us want to be on that corner with our friends and family a truer picture might appear to be “on the corner of harried and hopeless”. On that corner we hear “I’m too busy to join the Knights right now … you know it’s the kids, job, travel, etc.” and at that same intersection our KofC Recruiters accept this reason without an adequate answer .. Something like we acknowledge that you are busy, we all are. However you should know the amount of time put in with the Knights is completely up to you. Even one or two Saturdays a year is a big help. Also, with the family oriented activities we offer, a man will have more meaningful opportunities to spend time with his family growing in faith and service. Finally, it’s our camaraderie in faith that is most attractive I believe as I hear it from Knights all the time. Meet us where and when your family’s journey intersects our Knights activities. It just may be at the intersection of Family and Knights that together we will discover the corner of Happy and Healthy enjoying the combination of faith, family and fraternity. This is Mike Gaspers and you are listening to the Knight Life show where each week we strive to tell the story of the Iowa Knights from an insider’s point of view. This week we’ve heard from District Deputies and Past Grand Knight Paul Martin on so many reasons to be enthusiastic about the Knights of Columbus and what we can do together in service to our Families and our Faith. Supreme Knight Carl Anderson spoke about the need for the Knights of Columbus during his Annual address. I’m Mike Gaspers, thank you for listening. Feeling inspired? Then act courageously and with love to put your faith into action by word and by deeds starting in and with your own family.